Charlie’s love of music led to a long career of singing with quartets, included Bill Gaither & Charlie’s own quartet, The Foggy River Boys.Charlie entered the Army with Elvis Presley and they became good friends. He worked for Elvis and lived in Graceland for 17 years. 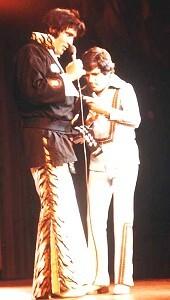 After Elvis’ death, Charlie continued to perform in shows dedicated to Elvis’ memory For the past 15 years Charlie performed at Memories Theatre 2141 Parkway, Pigeon Forge, TN He also traveled the world sharing Elvis stories speaking and performing. Survivors include his loving wife, Jennifer Hodge & sister Margie Poteet. Charlie Hodge, Elvis’ army buddy and friend until his death in 1977, has been diagnosed with cancer. He has secretly been battling cancer the past two months Charlie first met Elvis on the transport ship from the New York to Germany, September 1958. They stayed friends until Elvis’ death in August 1977. Charlie was the guy who sang back up, played guitar, handed Elvis water and gave him scarf’s on stage during the shows in 1970’s. From Memories Theater where Charlie Hodge has been performing Memories Theater for the past few years, and he was struck down with cancer. Despite his diagnosis, Hodge continued to perform nightly “…if you were not aware of his condition, you would never know he is sick.” His humor remains high, as did his faith in God. WHEN DID YOU FIRST HEAR THE NAME ELVIS PRESLEY? Wanda Jackson had completed a Grand Ole Opry tour, she said, “Charlie have you heard Elvis Presley? Nobody is willing to follow him.” So I wanted to see this dude. I first saw him on the Ed Sullivan Show sing, “Blue Moon of Kentucky” like I’d never heard before. Elvis really freaked me out. I remember thinking this guy is great. He was the start of a whole new thing in music. WHEN DID YOU FIRST MEET ELVIS? Backstage in Memphis. I was with ABC Network Show I had the number one gospel group at the time. And you know Elvis loved Gospel music so he came backstage to met me and my quartet. I didn’t see him again until we got drafted. He didn’t recognize me. I had a crew cut man’s greatest disguise.I went over to him and asked when was the last time he saw Wanda, Elvis said, “Hey you look familiar?” I said, “I’m Charlie and I was lead singer with the Foggy River Boys.” “Hey man I used to watch you on TV every Saturday night,” said Elvis… Imagine Elvis watching me? YOU WERE WITH ELVIS IN GERMANY? Yes we both went to Fort Hood. However, we were never stationed together. Going on the train to Jersey we both sat and talked about the folks we knew in the Gospel field. On the ship to Germany he requested that I share his compartment with him. In the first place they put him with a few sergeants so that the other troops wouldn’t bother him but he didn’t know anyone. So Elvis went to the Captain and asked if I could put with him and the rest as they say is history. WHO WERE ELVIS MUSIC PEERS? Elvis liked all kinds of music he had lot of albums. Various artist in the Country, Pop and Gospel field. He would often listen Mario Lanza. Even in Memphis as a young man, Elvis would go to a place called Blues Alley and spend hours listening to Blues singers. He would list to Gospel and even symphony music. He could appreciate all kinds of different and varied musical styles; he just adored Gospel, JD Sumner and the Stamps Quartet. JD and myself are great friends we go back some 40 years. JD would often let Elvis in the back door whenever the Blackwood Brother were singing. 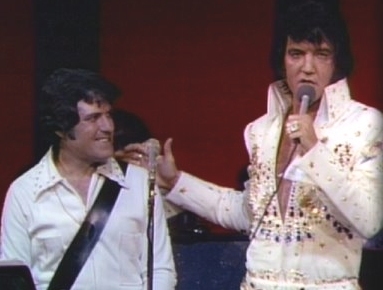 In those day Elvis was so poor he couldn’t afford to pay to see the group perform so JD let Elvis in. 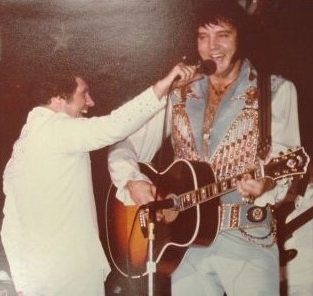 Elvis never forgot what JD did for him. WHO WERE ELVIS INFLUENCES? You’d be surprised Elvis had certain sounds which he would use like what he called his Billy Eckstein voice on “Fame and Fortune.” He loved Mario Lanza’s voice in fact he could sing as high as Mario Lanza. Elvis had a three octave range which is a fantastic range for an untrained singer. Let me tell you Elvis never had a singing lesson in his life. Anyway, Lanza highest note he ever got was a C above the middle C and I heard Elvis sing a high C many times on stage. WHAT WAS ELVIS’ FAVOURITE ALBUM? I think in Elvis has a choice of albums, I think his choice would be any Gospel album he recorded. YOU DID APPEAR IN SEVERAL ELVIS MOVIES? I appeared in Clambake I played a barber. I was briefly in Charro as a Mexican in the scene where Elvis rides into town. In Stay Away Joe I was in that too. I remember one funny moment there’s a scene in the movie where there was a fight in the house. Elvis looks outside the door where I’m standing with the band. The camera is shooting Elvis from his left side and Elvis say would you guys play a little something we’re have a little trouble inside, and we both laughed which wasn’t in the script. The reason we laughed so hard is that it was very cold and Elvis nose was running. WHAT WAS VEGAS LIKE? Elvis hadn’t appeared on stage since 1961 the first time he was in Vegas they booed him. When I was with Elvis, he would stand there and grin and I would have to know that he wanted a drink.I remember a little girl from Japan who go up on the stage Elvis turned to her and said what do you want honey scarf or a kiss. She looked at him and said no. Elvis asked her again what she wanted and she said James Burton. Elvis roared with laughter and walked the girl over to JB who kissed her then she just stood by Elvis. He asked her if there was anything else, and she said that wanted a scarf and a kiss. Elvis put the scarf around her neck and she asked for a kiss. “Charlie!” shouted Elvis, “give this girl a kiss.” and walked off laughing.